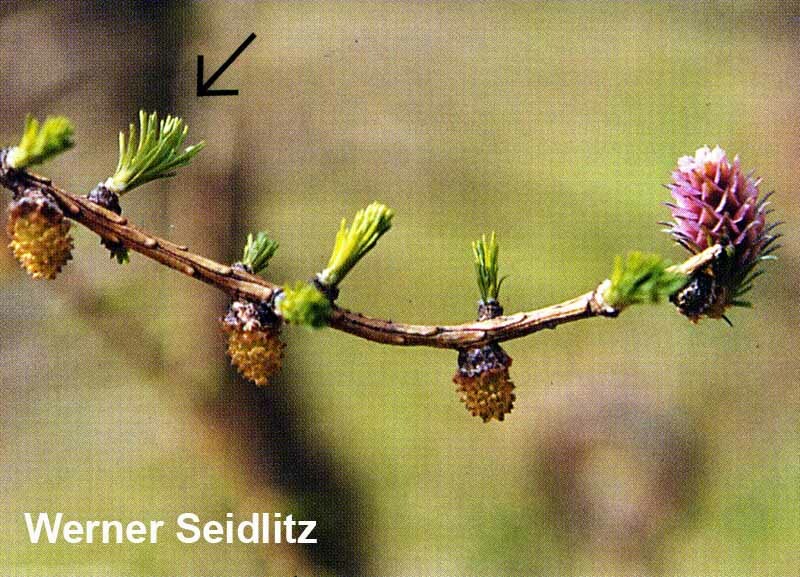 Larix laricina – Larch is the only conifer that sheds all of its needles annually. Form: The tamarack is a medium-sized tree that grows to a height of 20 m. It has a narrow crown, thin scaly bark and long, slender, pliable branches. The bark of young trees is gray and smooth, becoming reddish brown and scaly with age. 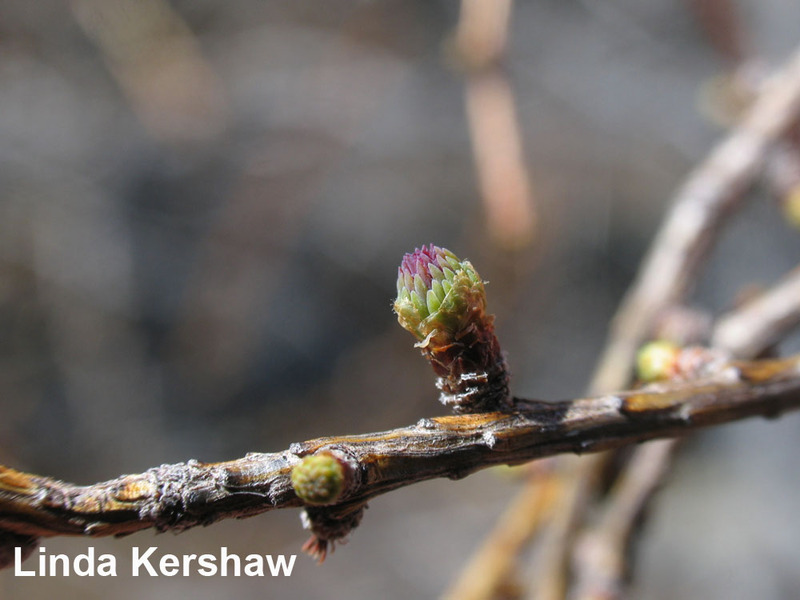 Winter branches have numerous small knobs which in the spring form the base for a tuft of needles, or a male or female cone (“flowers”). Leaves: The soft, very slender needles grow in small clusters of 12 to 20, and are 10 mm to 25 mm long. As in all larches, the needles are deciduous, turning from pale green to a spectacular bright yellow in the fall, then falling. Cones: Both male and female cones may appear on the same branches. They look quite different. For Plantwatch, keep an eye on when the male cones produce pollen. The male (pollen-bearing) cones look like small mounds (less than 5 mm wide) of brown to yellowish pollen sacs with papery scales at their base. They can be found along the branches, but are more abundant in the lower part of the crown. They appear in early spring, shed their pollen, and then wither. The seed (female) cones look more like a small pine cone. At flowering time (pollination) these conelets are dark red to violet, but later are light brown in colour. 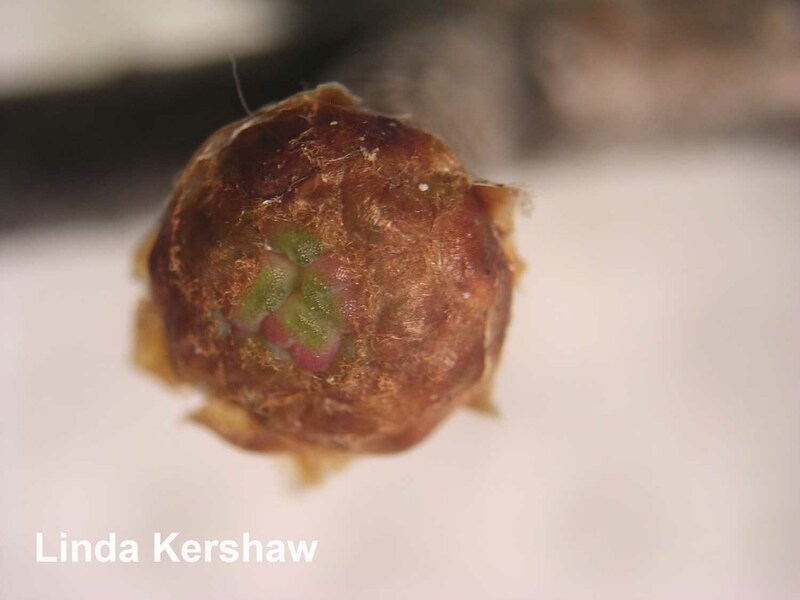 Mature seed cones are 1 cm to 2 cm long, oval-shaped, and are found on short stout curved stalks. An important feature (other than distribution) that differentiates this species from other larches is the length of the cone bracts. 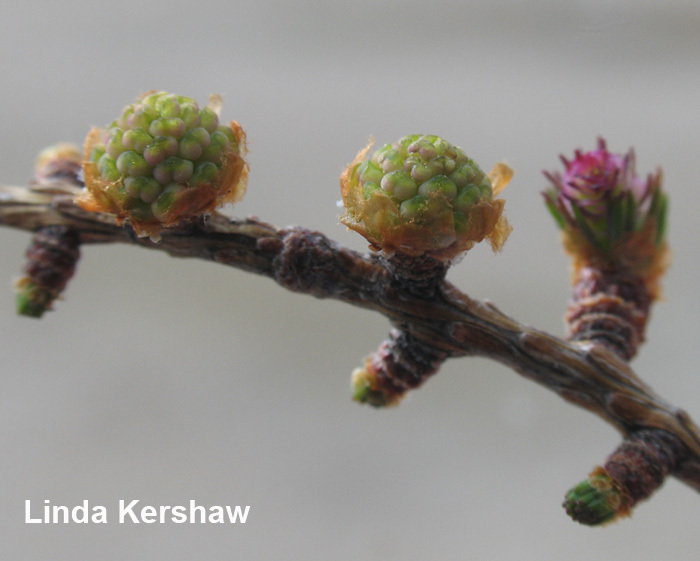 In tamarack the bracts are much shorter than the scales, while in the two other native Larix species (which occur in western Canada), the narrow cone bracts are longer than the scales. Circumpolar in boreal forests, the tamarack occurs in the east from Newfoundland, Labrador and Nova Scotia, south to Pennsylvania, and west to the mouth of the MacKenzie River, western Alaska, and British Columbia. This tree prefers a bog habitat in full sunlight. It is usually found in cold, wet, poorly-drained sites, often mixed with black spruce, but is also found in moist but well-drained light soils in mixed forests. It is rarely found in pure stands. Tag a tree for observation. With your thumb and forefinger, flick a low branch (with male cones) to see when a small cloud of pollen is released. Try this daily starting soon after snow melt: pollen shed can be over in only 3 days! First bloom: when the first pollen is being shed by the male cones on the observed tree (in 3 different places). Mid bloom:when 50% of the male cones are abundantly shedding pollen. Record the date when, in at least three places on tree, the tuft of needles, after considerable lengthening, starts loosening up and spreading at the tip. Production of seeds begins when the tree is about ten years old. 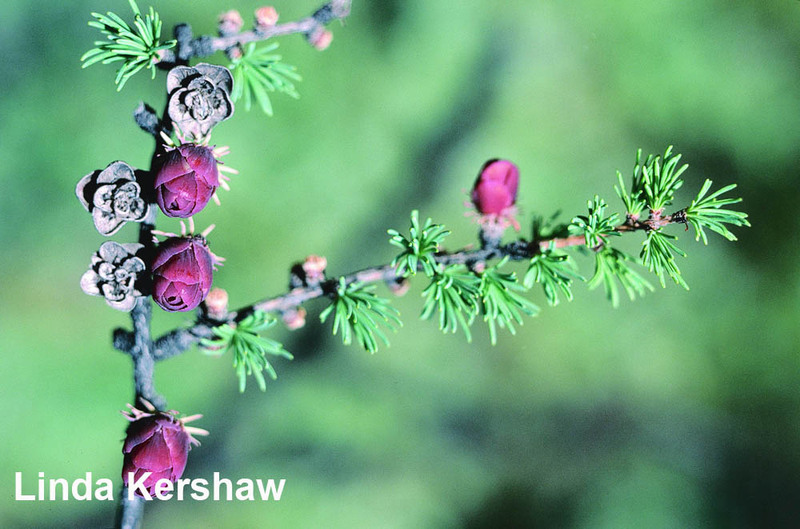 Like other conifers, Larch has masting years when very abundant male and female cones are produced. In some years it may be harder to find male cones. Flowering occurs in early spring, from late April to early May depending on location. Seed cones start to open in mid-August, and seeds are shed during the following months. The seed cones persist on the tree throughout the winter and the following summer, while the pollen cones wither and fall away after the pollen is shed. Tamarack seeds are primarily wind dispersed, but red squirrels disperse some seed. Most wind-dispersed seeds fall within a distance of two tree heights, but a small percentage travel greater distances. The needles begin to form on the trees from mid-April to mid-May, about the same time as flowering occurs. Larch forests in some regions have been severely damaged by larch sawfly, which eat the needles. If needle removal lasts a long time, affected branches or the whole tree can die. Vegetative reproduction through layering (where branches touch the ground they produce roots, and a new tree can grow) is the main mode of reproduction near the northern limit of the species’ range. Stunted individual trees in peat bogs can be about 100 years old, yet only a few feet high. Tamarack is a pioneer or early seral species. It is often the first tree to invade open bogs and burned peatlands. This species also tends to prefer soils derived from rocks rich in lime. First Nations Peoples have used the inner bark of tamarack to make a poultice for burns, boils, frostbite, infected wounds or deep cuts. Other traditional medicinal uses include treatments for colds and urinary tract problems. A tea made from the needles, which are high in Vitamin C, was used to prevent scurvy by First Nations People and early explorers. Bornyl acetate, a volatile oil of tamarack is an expectorant, and other terpenoids have antiseptic activity. Tamarack roots were used in canoe-making. The same raw material was also used by early Canadian builders of wooden ships, to join ribs to deck timbers, or to build keels. Toboggans, canoe paddles, snowshoes and drums are all items that have been frequently made out of tamarack wood by First Nations Peoples. The rotted wood was used to smoke fish and hides. The bark may also be burned to smoke hides. Twig bundles are bound and fashioned into sculptures of geese by northern First Nations. In areas where the tree reaches sufficient height, the tamarack also has value as commercial lumber, for uses such as railway ties and poles. Species of Larix are present in most boreal regions; they often form only a minor component of the vegetation. Only a few have received any horticultural attention. Some cultivars exist for the most commonly cultivated Old World larches, but almost none for the North American species. 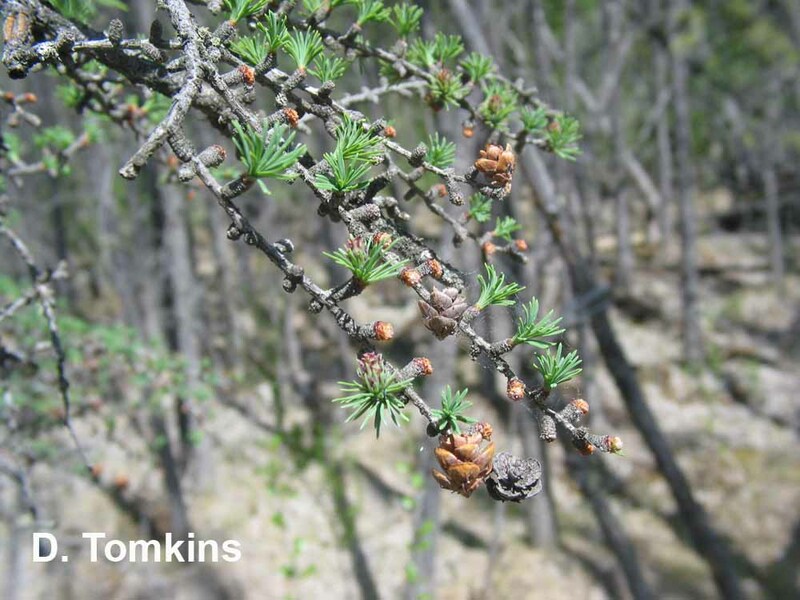 One of the species commonly cultivated in horticultural settings in Alberta is the Siberian larch. This is a very large tree, growing to a height of 30 m with a spread of 10 m. Although hardy, it requires plenty of water. Farrar, J.L. 1995. Trees in Canada. Fitzhenry and Whiteside Ltd., and Can. 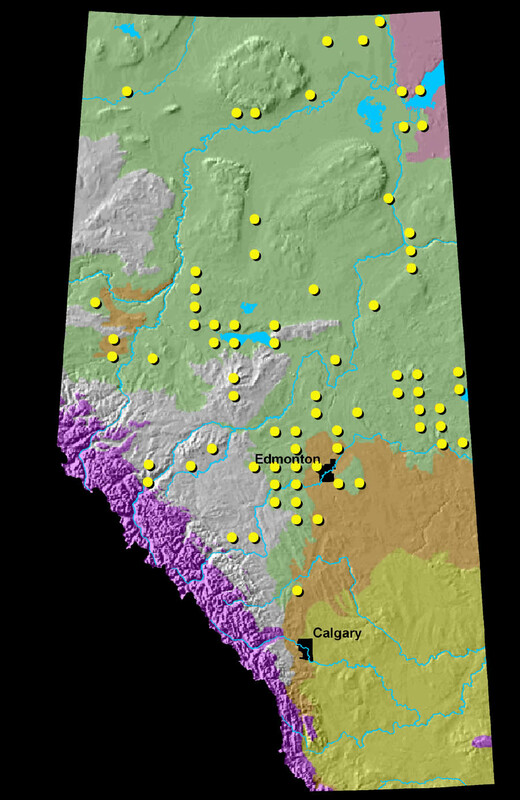 Forest Service, Natural Resources Canada. Markham and Ottawa, Ontario. Pielou, E.C. 1988. The world of northern evergreens. Comstock Publishing Assoc. Ithaca, New York. Zinck, M. 1998. Roland’s flora of Nova Scotia. Nimbus Publ., and Nova Scotia Museum. Nova Scotia.